Spooky Action: Who Will Be the Li and Fung of IT Outsourcing? Who Will Be the Li and Fung of IT Outsourcing? Have you ever heard of Li and Fung? Are you wearing clothes right now? If so, it's a pretty good bet that one or more pieces came through Li and Fung's supply chain. In the worldwide garment business, Li and Fung is the 800 lb gorilla, and they are light-years ahead of their competitors. A few years back I did some work with a major clothing company here in the states, and learned about the garment industry supply chain. A couple generations ago the U.S. had a thriving garment manufacturing industry. But that was virtually wiped out by manufacturers seeking cheaper labor in other countries. 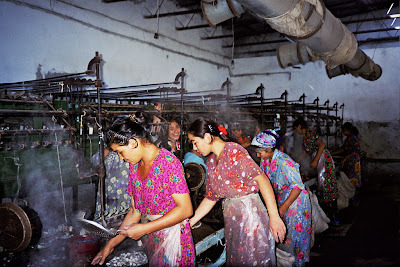 China and India were the first countries to benefit from these moves, but many other countries in southeast asia, the middle east, and even the Carribean basin have textile manufacturing plants. At first, many of the major garment companies tried a vertical integration approach, where they owned all the pieces of the supply chain. This ultimately proved uncompetitive, since new factories with superior cost and capability were constantly springing up. We have thousands of partners in our supply chain that can meet any level of quality you desire. You give us the specs for a manufacturing run, and we'll find the best suppliers at the best price and guarantee the quality of the merchandise. Even better, if you are flexible with the designs (e.g., button shape), we will work with our suppliers to create more economical alternatives for your consideration. Even including our fee, the price will be lower than you will get in-house or from anyone else. So what gives L&F their advantage in supply chain management? The Li and Fung Research Center explains that the company has seven principles forming the pillars of supply chain management. The research group says the key is that the “supply chain must be flexible, agile, cost-effective and responsive. Nowadays it is more common for companies to collaborate in a global context where each of them focuses on its core competency and outsource the rest.” L&F has taken its core competency to the extreme by perfecting the science (and art) of outsourcing. The company follows the following principles to assure it stays at the leading edge of supply chain management theory and practice. i really like your topic. it gives benefits like awareness and informations..its so nice.. can you check out our site..
your topics show how li and Fung run there business. nice topic you give the reader's an idea.. In late 70ts there are many company's which are shifted from U.S to Asian countries for the search of cheap labor. As labor in Asian countries are cheaper,the companies can gain huge profits. This is one type of Supply chain management system which was followed in those days. I'm not a big fan of geographical labor arbitrage as a profit-building strategy, but it HAS been widely used.